Geologists have long debated how and when the Colorado River made its first connection to the ocean. In a new study, a team led by the UO’s Becky Dorsey has helped pull the river’s story together. The river did not, as many thought, simply roar down out of the Colorado Plateau and pour into the Gulf of California. 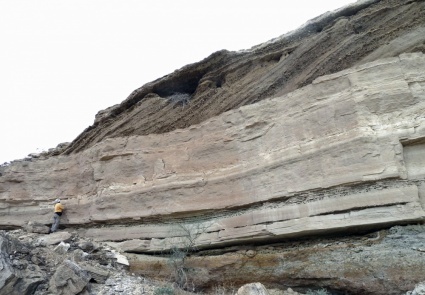 In a paper published in the journal Sedimentary Geology, Dorsey’s team proposes that lower stretches of river were influenced by shifts in underlying bedrock and changing sea levels. The river experienced a series of stops and starts between roughly 6.3 and 4.8 million years ago. The clues emerged from examining layers of sediment exposed in rocks along the river, along with detective work to identify fossils found in the layering. Integrating that data opened a window on “the different processes that controlled the birth and early evolution of this iconic river system,” Dorsey said. The team studied the southern Bouse Formation from near present-day Blythe, California, to the western Salton Trough. That area is north of where the river now trickles into the Gulf of California. The Bouse Formation and deposits in the Salton Trough have similar ages and span both sides of the San Andreas Fault, providing important clues to the river’s origins. 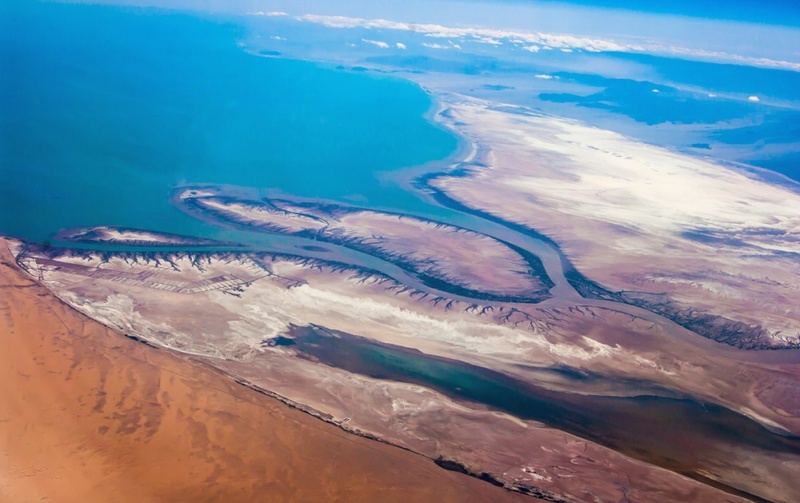 Last year, in the journal Geology, a project led by graduate student Brennan O’Connell, a co-author on the new study, concluded that tidal currents had left sediments along the river near Blythe. The Gulf of California, it was argued, extended into that region, but the age of the deposits and tectonic and sea level changes at work during that time were not well understood. Analyses by Kristin McDougall of U.S. Geological Survey, also a co-author on the new paper, found that those deposits were laid about 6 million years ago when tiny marine organisms could have lived together in the water. About 5.4 million years ago, however, conditions changed. Global sea level fell, but the bay’s water level, instead of declining, increased as tectonic activity lowered the bay’s bed. Materials left by marine organisms were covered by clay and sand brought downstream by the river. About 5.1 million years ago, a tug-of-war lasting 200,000 to 300,000 years began when the river stopped delivering sediments from upstream, probably the result of earthquake activity. The delta retreated. Seawater and marine sediments returned. At about 4.8 million years ago, river-delivered sediments again returned and rebuilt the delta. Today’s delta, however, reflects human-made modern disturbances. To meet agricultural and drinking-water demands, Hoover Dam was constructed to form Lake Mead during the 1930s. Glen Canyon Dam, completed in 1966, formed Lake Powell. “If we could go back to 1900 before the dams that trap the sediment and water, we would see that the delta area was full of channels, islands, sandbars and moving sediment. It was a very diverse, dynamic and rich delta system. But manmade dams are trapping sediment today, eerily similar to what happened roughly 5 million years ago,” Dorsey said. The research, Dorsey said, provides insights that help scientists understand how such systems change through time. Mindy B. Homan, a former UO doctoral student and now a geologist with Devon Energy in Wyoming, was a co-author on the study, which was funded by the National Science Foundation, Society for Sedimentary Geology and Geological Society of America.